Something about the fourth quarter of the year and marching toward the holiday season brings about a great deal of gratitude and retrospect for the year behind and the one that lies ahead. 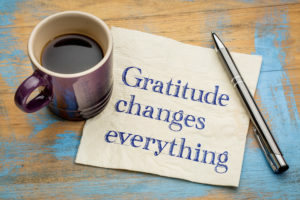 While practicing gratitude all year long may be ideal, there is something special about the Thanksgiving season, perhaps because it sets aside an entire day to consider and reflect on being thankful. Grateful and thankful are words often used to express positive feelings of gratitude. Simply put, gratitude is a noun defined as “the quality of being thankful; readiness to show appreciation for and to return kindness”. 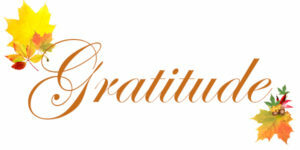 Deep gratitude must come from within, be meaningful, and start with an acknowledgement that all is good and rewarding. The utility that comes with gratitude is compelling to the receiver and manifests through acts of paying it forward. Think about a Starbucks drive through where the person ahead of pays for the coffee of the driver behind, which in turn compels that driver to pay for the next person in line… and so on. Great example of how a compelling act of kindness generates gratitude and returns more kindness. Gratitude helps people realize what they have and creates an awareness of gratefulness. Society has been trending toward extending empathy, compassion, and thankfulness, especially during the holiday season. But choosing gratitude beyond the season toward people who make our lives better through acts big or small is an influential contributor to joy. Gratitude is a powerful antioxidant that can strengthen relationships, improve cardiovascular and immunological health, and reduce stress. Mark Twain once said, “I can live two months on a good compliment,” but he only told half the story. The person receiving the praise enjoys feeling noticed and valued and is motivated to do more of the same, while the giver also basks in the connection. With every compliment given, a bond is strengthened, trust is built, and conversation encouraged. Compelling, potent, powerful stuff! Thanksgiving week in the United States is a popular time to post about gratitude, and in the spirit if this holiday, thinking about gratitude for our clients comes naturally. The true depth of our gratitude generates an awareness of the amazing things we experience, not just this month but every month. Our clients are inspiring, awesome people and thanks to introductions, social media, and word-of-mouth, we have met and get to work with incredible partners and friends. Our clients allow us to work with a variety of industries. It is exciting to learn about different operations and environments, which enhances our commitment to focused strategies and expertise. Our clients are creative, give constructive feedback, and empower us to revolutionize, knowledge share, and work together, driving greater productivity and profitability for their businesses. We have many different examples of how our partnerships eliminate silos, save time and money, and improve efficiency. Through our connections with you, team members learn from each other, collaborate at very high levels, and sustain passion for why we do what we do. We are lucky, thankful, and filled with gratitude.